Showbiz comes to Oxford in the form of Britain’s hottest new talent show and tearoom owner Gemma Rose gets a peek behind-the-scenes when she’s asked to cater for the event. But Gemma soon ends up with more than she bargained for… when she comes across a frozen dead body! Poppy is enjoying her new life in an English village and restoring the beautiful cottage garden nursery she’s inherited. 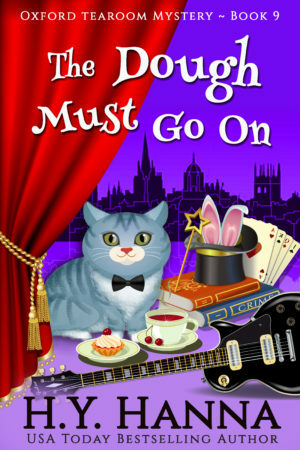 When she is hired to create a “canine scent garden”, the future looks rosy… until she finds herself spade-deep in a murder investigation again! Audiobook lovers – BLOOD, SWEETS AND TEARS (the 4th book in the ‘Bewitched By Chocolate’ Mysteries) is now available! "Poppy is settling into life in an English village and gaining some green fingers at last as she restores the beautiful cottage garden nursery she's inherited. 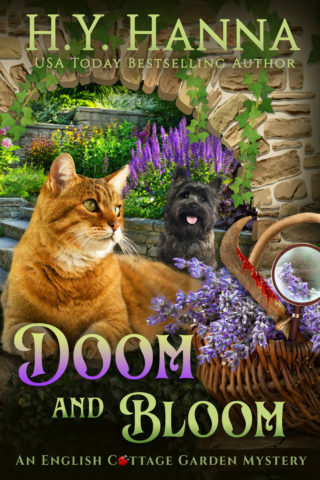 When she meets a wealthy dog lover at the village fête and is hired to create a "canine scent garden", the future looks rosy... until the day ends with a vicious killing and she finds herself spade-deep in a murder investigation once again. Yeah! Bought it and reading now!! Just started reading this on Kindle. Poppy picks up right where we saw her last, diving into a business she knows nothing about, while contemplating (yet another) murder in her new found community. Should be interesting. Oh boy. Can’t wait to download it and start reading! I love Poppy and am so glad the wait for Book 3 was not so long! Yay! Just downloaded! Loved the first two books! Downloaded and ready for the weekend that suddenly improved. I just finished this today... if you could only write as fast as we read ;) Cottage Garden is the first series of yours I have read.. I have enjoyed the read! Yay. Going to order it immediately. Those are gorgeous, and I'm sure, smell heavenly! Just gorgeous! I wish I could smell the scent! Beautiful! I miss growing roses. I love David Austin roses! Yours is stunning! One of the prettiest roses I have ever seen. Fantastic! Can't wait to read it! Love it! I can’t wait to see what Poppy is getting into! I love it. After seeing the previous covers in paperback I love them even more. Beautiful. Love it, you are very talented. Love it! Can't wait for the book to be out. I'm hooked on all your books. It looks good. Very attractive. Super just started reading about Poppy. Can't wait to see what her future holds! I just finished book 1; I loved it! Can’t wait to start the second one! Sometimes I forget the Southern Hemisphere is opposite from the northern. Here in Montana we are still waiting to pass the frost free date before moving plants outside. Oh, to have a garden like that - where I live here in Tennessee, the soil is very strange. We either get too much rain or two little and the soil becomes susceptible to fungus. Last year I found the weirdest thing growing in the front garden - it looked like a chicken's skinny leg, foot and all, sticking up out of the soil. Never saw anything like it before. Hope to never again. This year I hope things go better. I'm adding various nutrients to the soil. Your garden is so beautiful. It looks like a great place to curl up with a good book. Who does this artwork? It's gorgeous. :) Congratulations on a great review! Congratulations 🎈That’s amazing and well deserved! You are my favorite author. A great review, totally deserved. I love this new series as much as the first two. Love the cover style of these books. Looking forward to number 3. Will the series eventually be available on Audible? I’m loving this series and I’m couple of the quirkiest characters ever plus some interesting mysteries and storyline. I can’t wait for Book 3. Love the series.. Can't wait for book 3.. I am enjoying the first book in this series. An enjoyable cozy read. Are these on audible yet? I can't wait for the next book I LOVE this series.I love all your books actually. Can't wait - the first two were awesome! Dying to read book 3. This series is wonderful. Great character development and story lines. I am sending you a video of my flower bed. I will never have a beautiful cottage garden, but I finally have my gardenia along with some roses. Hope to have more flowers next summer. Yay!!! I can't wait! Love this series!!!! Congrats! Are you are a cover genius! I love the new series! Love the basket of purple flowers on the left bottom. H.Y. Hanna - Author shared a post. (the "forgot how to talk to humans" part is SO true!! :P )Well, this is a bit too close to the bone. I teach online computer classes from home. I so relate to the same clothes 3 days in a row! 🤗 I talk to humans all day for hours at a time, often with no response from those humans, and it is absolutely exhausting. Not all it's cracked up to be. You have to walk away for a bit, sit outside in your garden with a cuppa tea for awhile and then go back to it. People at work places get coffee breaks. My daughter works from home and gets got to walk the dog breaks. It must be really tough, but when you get discouraged, remember all the pleasure that you give us, your faithful readers. "Magical chocolates, missing jewels, and murder...."
Looking for new Tea Shop? Where I work we have to wear noise cancelling earplugs or earbuds. We are allowed to listen to music while we work. But I listen to audiobooks. I finished the new book the day I downloaded it. It was so good! So ready to dive in! Yahhh. I have credits..... back to my fav author!!! I’m listening right now! I love Uncle Victor. Bought it, I think on the first day available, and finished it the same day! Loved it! I've just recently discovered your tearoom series and I am absolutely in love with it 💖. The old biddies, I can absolutely see and hear them. And Muesli, of course 😀 - the speaker is also brilliant btw. Fancy an author visit to the Albany library? Just got it!! Yay!! Starting it right now! !